While some people crave raw cookie dough more than baked cookies, consuming raw cookie dough is associated with a number of health concerns. Raw food products can harbor bacteria that can cause you to become ill and experience intestinal distress, vomiting or kidney failure. In addition to not eating it, you also should carefully handle cookie dough in its raw form to avoid ingesting potentially harmful bacteria. In June 2009, food manufacturer Nestle recalled its Toll House cookie dough due to concerns the cookie dough had become contaminated with the E. coli bacterial strain. Nestle recalled the cookie dough after more than 60 people fell ill and nine suffered kidney failure. Although the company advises people not to eat raw cookie dough on the label, the dough could still be dangerous if a person touched it without washing her hands or cooking surfaces after handling it. The cookie dough recall followed others related to foodborne pathogens found in spinach, peanuts and peppers. It's not just premanufactured cookie dough that can be dangerous to your health. Cookie dough that you mix at home also can contain contaminated products. Eggs, even pasteurized eggs, can have bacteria in them when uncooked. Other components, such as flour, also can contain bacteria when left uncooked. The same is true for foods such as uncooked pizza dough. 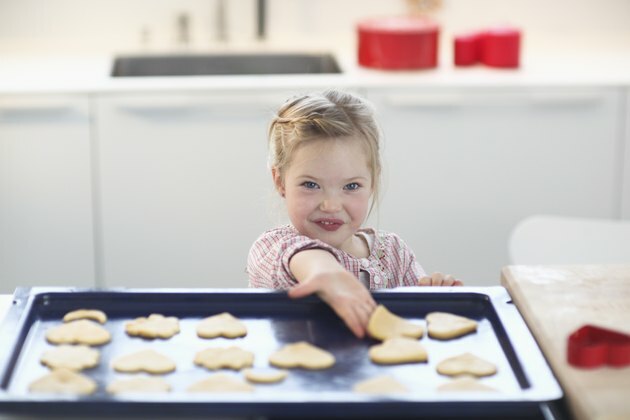 The heat from baking the cookies helps to kill the bacteria to prevent it from infecting you. You also should carefully inspect all components you use to bake for discoloration, leaking packages or abnormal smelling products, which can indicate you have contaminated foods. Signs you have experienced bacterial contamination from eating raw cookie dough include diarrhea and abdominal cramping. While humans naturally have E. Coli in the gastrointestinal tract, the bacteria can be especially harmful to those that already have lowered immune systems, such as people with kidney disease or cancer. In addition to E. Coli, salmonella bacteria also live in uncooked eggs and can cause similar digestive distress as E. Coli bacteria. In addition to not eating it, carefully handle raw cookie dough. Wash your hands thoroughly with an antibacterial soap before and after handling it. Use an antibacterial cleaner to reduce the risk for bacteria on contaminated surfaces. Taking these steps can help you to reduce your risk of experiencing harmful effects related to cookie dough handling. Does Cookie Dough Cause Intestinal Parasites? Can You Get Salmonella from Undercooked Brownies? Can Pregnant People Eat Brats?